With Caitlin’s new baby brother arriving in just a few months, her parents are now getting the baby’s room ready. While I was admiring his new room, we talked about moving Caitlin into her first "big girl bed." Of course, they were worried that she may fall out a few times before she gets used to her new space. So the question came up, "Is there a “right” time -- developmentally speaking -- to move children out of the crib and into a bed of their own?" Now, of course, the answer depends on the child as it always does, but I thought it might be interesting to discuss how children learn NOT to fall out of bed. It has to do with their relationship with space, which is managed by the Proprioceptive Sense. First, a child's sense of space -- known as spatial awareness -- is acquired through lots of trial and error with the wide-awake world around her. As she moves through different size spaces and learns to negotiate objects and obstacles around her, she is learning to map her own body - to know her own size and shape. The human body has sensory touch receptors in every muscle, tendon and ligament known as proprioceptive receptors which provide the brain with important information about the dynamics of the world around us, including where the body or parts of the body are in space at any given time. Now, for adults, a familiar space such as your own bed has been carefully mapped by your proprioceptive sensors, so you are able to sleep without having to worry about falling out. You "know" how wide your bed is, how much space you have in your bed, and how much space your body takes up which allows you to toss, turn, and roll over while staying within the edges of the bed -- even in a new bed! But children's proprioceptive senses are still immature. And that's not only because of their age. Remember, they are always growing and changing shape too! So mapping their body and refining their understanding of space is a constant, daily developmental need. 1. 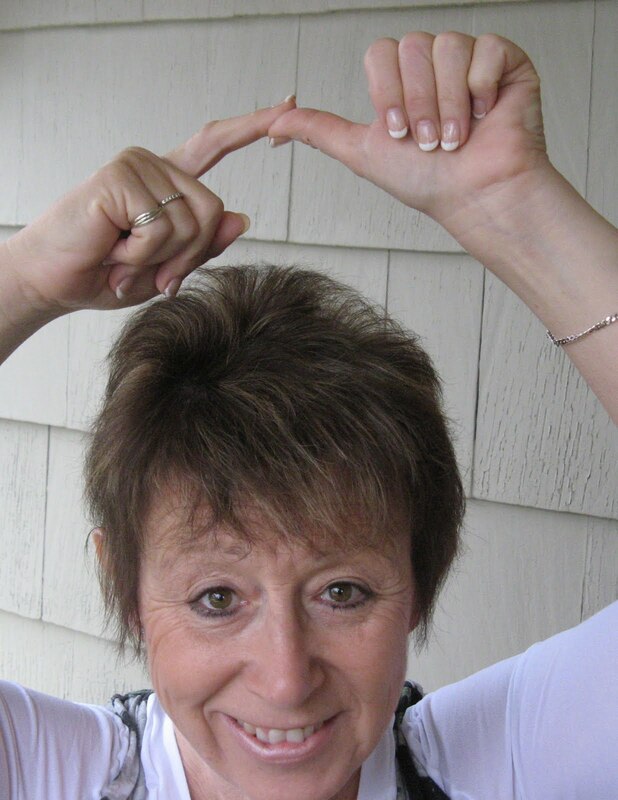 Place your left thumb in the air above your head (so you can't see it). 2. Put your right arm out to the side. 3. Lift your right arm over your head and touch your index finger to your thumb. Chances are, it took you several attempts to find your thumb, even though you felt quite sure you "knew" where it was! Now imagine navigating your entire day without a complete understanding of your own body or the space that's around you! That's what little ones are trying to work out all the time. So back to the original question. When are little ones ready for big kid beds? To help children build their own conscious and intuitive body map, encourage little ones to try to fit in, around, between, through, over and under things they come across. Chances are, they're doing this naturally all the time. 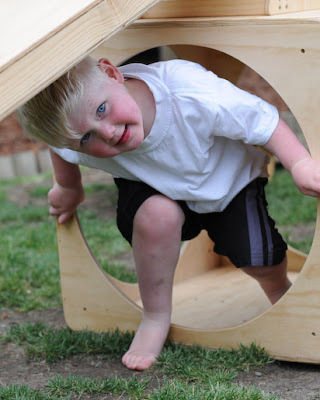 Climbing under tables, through tunnels, into cupboards, cardboard boxes, and pretty much anything else that looks like a fun place to hide is a great way to help build their own body map! 1. Start by having your child crawl around the bed, touching and exploring the edges. Do this both on top of and under the covers. 2. Play some more, having her wiggle and then roll around, again, both on top of and under the covers. 3. Have her crawl around the perimeter of the bed so she gets a feel for the size and scope how the bed changes the dimensions of her room. And don't forget to explore under the bed too! 4. After you've explored for a while, have her close her eyes and roll towards you, being sure to be there if she rolls too far. And of course, it's always a good idea to put some soft pillows on the floor around the bed until she gets used to it. Soon you'll see that her proprioceptive senses will adjust, her big girl bed will fit her to a tee, no matter how much she tosses and turns! This is a great post. 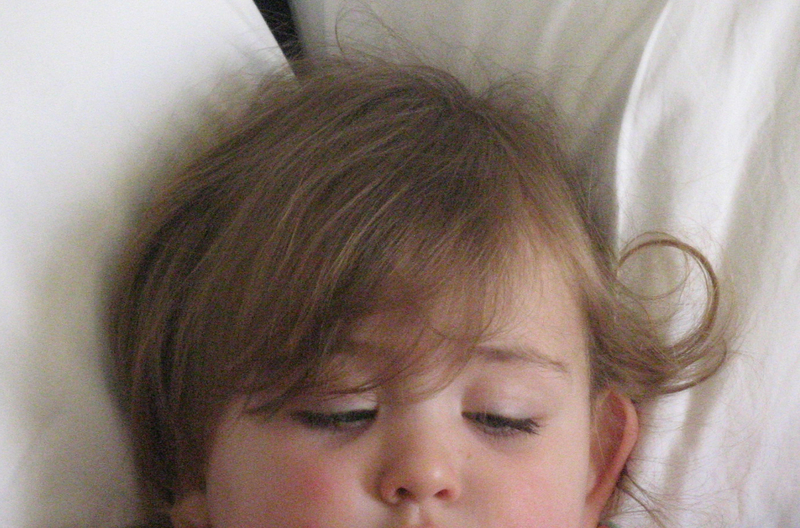 Criteria #1-new sib arrives is not necessarily the one that means the child is ready for a new bed. Love the "bed safari" concept. I am curious about your thoughts on how this translates for cosleeping children! We are thinking of transitioning our 19 month old into his own bed for part of most nights. (until 1st waking & then bring him in with us). He has always slept in a 'real bed' so I don't think we need bother with a crib, but my DH is worried he's too small and will fall out. Do you think the awareness he has from sleeping between two adults his whole life will translate into the ability to stay in a regular bed on his own? Great post! Sharing on Sunday surf! How about when the child is ready, shows readiness? That's been our guide. Another thing you might consider including is the whole evolutionary need to be carried by an adult for the appt length of time to develop the child's Proprioceptive Sense - primates do it and humans are no different. It's an essential stage in our development. And given that it starts from birth and continues ideally till the child wants to crawl or explore on the ground, it's the earliest assistance we can give to help them develop. Yes, later things count too, but this, for me, is the bedrock. Continuation of being carried in utero till the child is ready to take the next step, so to speak! .....oh, and there's a big difference between being 'physically' able to sleep in a bed w/o falling out and actually being ready, ie factoring in the emotional side too. Lucy - You make great points. Indeed, when your child is very small, it's important to keep them close to you, not only for the emotional comfort but for the physical and sensory experiences you've outlined. That, combined with floor time for freedom of movement, new body sensations, and different experiences with space create the balance necessary for the brain and body to build the underpinnings of spatial awareness. Thanks! Gill, great post. So interesting. 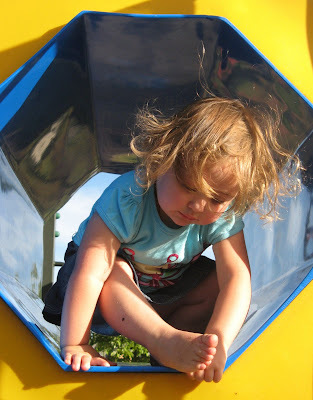 It's funny how kids seem to sense instinctively that they need this spatial training since they take such delight in "fitting" into interesting spaces, getting on top and under. Again an example of how instinctively we take delight in learning and growing when its done in a healthy manner. We needed to move first child, who was 20 mo. for 2nd child, so we crowded our bedroom by putting a twin bed between the wall and our queen size bed. Since we were already co-sleeping, if he got restless, I knew, could just reach over and he'd go right back to sleep. He was in his own room before he was 3. He's now 20 and has been sleeping in his own bed in a college dorm in another state since he was 17. Great, interesting post. I have shared a double futon on the floor with my little one from 3 months on and she's never fallen out. I read about the benefits of sleeping on a floor bed, rather than a cot, from a Montessori book. It helps spatial awareness from early on, as they see 360 degrees of the room, rather than limited vision through cot bars. We have a bed rail that helps help me feel he is safer. I need to go over this with my son so that he will feel safer. We were over prepared for our child-to-be...crib, bumpers, bed-rails etc. Reality: My son never took to the crib. We had to move directly from the bassinet to floor bed (had seen some of my friends do it). Probably at 13months he moved to a queen sized bed because he was ready. Never a fall...did we over anticipate? I personally believe that when a child starts climbing out of the crib.This is a very good indicator the the child should have a bed. Both our daughters went from co-sleeping to floor beds and eventually to "big" beds at around 2 years old. Neither of them has ever fallen out, we think it's because they got used to their bed space while it was still safely on the floor. This made us confident enough to move our youngest into the top bunk just before her 3rd birthday! Body Maps & Bedtime...LOVE IT! who will not love to have such kind of outstanding blog.